It’s time to grow Garlic!!!!!!!! Everywhere I look now, I see plants responding to these amazing growing conditions. Autumn is always a great time to plant, but when we get over 100mms of rain, our gardens explode with fresh new growth and more flowers. We planted Violas in hanging baskets a couple of weeks ago and now they have tripled in size and they are covered in flowers. They make me smile every morning when I arrive at work. If you’ve got pots or hanging baskets, in sunny spots, grow these amazing winter flowering plants and they will make you smile too. You can buy 4 plants for $12.00. They are great value. You only need a few to make your garden smile again. It’s time to plant Garlic. This is so easy to grow, you won’t believe it. Simply come and buy an Australian grown, Garlic clove, from us for $2.50. Break it up with your fingers into seperate scales. Plant these 15cms apart in well prepared garden soil in a sunny spot. Plant them pointy end up, just below the ground. Cover with Sugar cane and water well. I’m assuming you’ve dug Tim’s Cow Manure and FAST FOOD into your soil. The Garlic will pop up within 14 days and it’s ready to harvest in late October when the leaves turn yellowish. Dig them out, wash the soil off the roots and hang up to dry in your garage. They can be eaten immediately and will last for 6 months. This will be the sweetest, juiciest Garlic, you have ever eaten. If you don’t own a garden, grow your Garlic in a pot using Tim’s Potting Mix. P.S We had a recall on our Tim’s Best Potting Mix last week. We sold one pallet of Mix before we realised it was not Tim’s Best Potting Mix. The manufacturer used the wrong sized Ash in the mix. It looks like rocks!!!!! If you bought a bag, simply return it, for a replacement. It was sold over 4 days 28th, 29th, 30th, 31st of March. If you bought Mix before or after these dates, it’s fine. Our Tim’s Best Potting Mix is the Best Potting Mix on the market, so we want you to have success. The loader driver at the factory must have fallen asleep! If you’ve already used it, simply bring back the empty bag. Keith Leader came in on Monday. I was having coffee, so I invited him in. He has milk with 2 sugars. Keith dropped into the nursery in November 2017. His wife had just passed away and he was moving into a retirement village in Camden. He brought in seeds from his Illawarra Flame tree that day. He called in on monday to buy a punnet of Pansies and a bag of Tim’s Cow Manure. He got a big surprise when I handed him one of the trees I grew from his seeds. He also loved to hear that I’ve planted 4 of his trees in the Campbelltown Business District. Keith is 93 but his mind is as sharp as a pin. He played golf until he was 90. He still has lunch with his old mate Frank Jones every month at the Bankstown Trotting Club. They get the seniors meal, Keith tells me. Keith cooks all his own meals at home. I asked him what he would cook for me if we had a date. “Sausages with steamed vegetables” was his reply. Keith is full of life. He’s a great story teller. He won us over. I invited him back for coffee. He took the tree but he doesn’t know where to plant it. His son lives at Oran Park but he won’t have room for a big tree. He’s going to ask the Retirement Village. I think he’s just going to carry it around for the day and chat up all the ladies. We had a happy ending to this story. Shane Finch, who is the gardener at Keith’s Retirement Village, contacted me to say, they were going to plant Keith’s tree!!!!! Orange Jessamine is bursting into bloom in gardens around Macarthur. 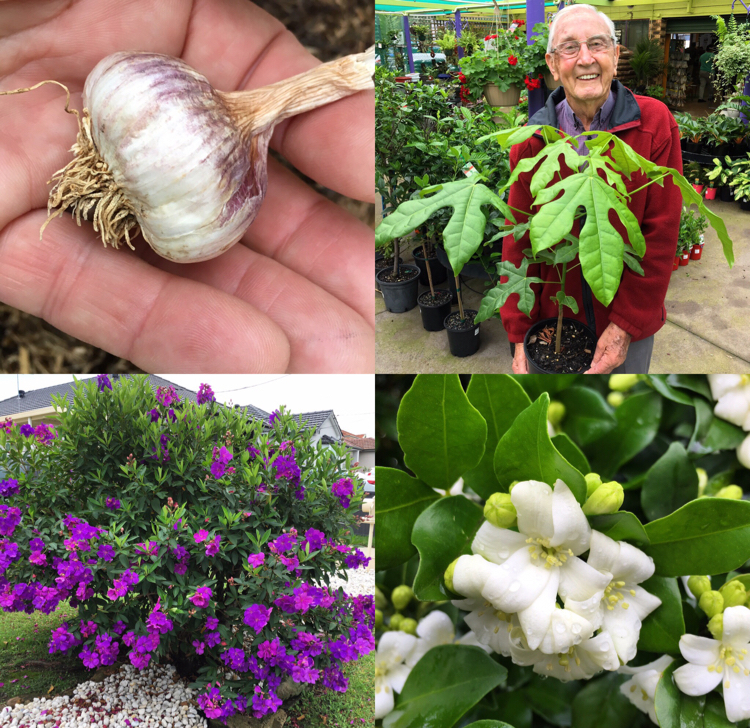 Botanically known as Murraya, this hardy shrub, always comes into flower after heavy rain. The perfumed white flowers smell like Jasmine. Murraya is one of the most popular hedging plants in Australia. It can be pruned like Buxus, to make a small box hedge, or it can be pruned into a tall hedge to give you privacy from nosey neighbours. It has beautiful glossy green leaves that make the perfect back drop for the highly perfumed white flowers. Murraya will grow in full sun or part shade. To make a hedge plant them 800mms apart. The more often you water, and prune them, the faster they will grow. They can grow up to one metre in a year if you mulch your garden and water often. We have Murraya plants from just $6.99. Bigger plants for just $14.99. Autumn is a great time to plant a hedge. World Naked Gardening Day is on the first Saturday in May, so you better hope it grows fast! Tibouchina alstonville will grow into a small tree if you don’t prune it. But the one above has been kept small with a heavy prune every September. It’s bursting into bloom now. The purple flowers look amazing against those dark green leaves. This one was growing in Bankstown. The white pebbles are optional. They usually end up next door, on the roof, if you have children. We have pink and white flowering, smaller growing varieties in the nursery too. Make the most of these fantastic growing conditions. Plant flowers, plant vegetables, plant a tree. Just plant something!!!!! !